The best way to comply with all the relevant electromagnetic interference EU standards is to consider them during the design. After all, standards are actually there to help us designers, not a brick wall to stop us designing. Look at where the design is connected to the outside world. What happens if there was a voltage surge? Where would all that extra energy go? The example opposite shows a simple inductor to minimise fast changes in voltages and also conducted radio frequency. 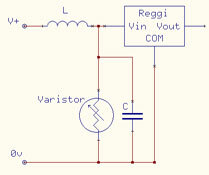 A varistor that only passes current when the voltage input is approaching the specification of the regulator and a capacitor to help smooth out the input to the regulator. Filtering needs to be adapted to the circuit. 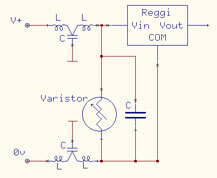 This example shows a design that has a higher level of filtering on both V+ and 0v. One thing to remember is that the device needs to be protected from a voltage surge and not fall into the trap of letting it remove the surge from the environment. It is always a good idea to put some resistance early in the power input so that the energy of the surge stays outside the device. Just like the power supply input. Protect signal lines with filters that do not interfere with the signal but offer protection from outside world. Make sure amplifiers have balanced inputs if they are looking at an external signal. If one of the inputs to an amplifier has a different impedance, common mode interference would not be cancelled out by the amplifier. Make sure the microprocessor behaves if the power is reduced slowly to switch it off and then increased slowly to switch it on again. Use some sort of watchdog. Keep power supply lines close together. Try and have a 0v ground plane running over as much of the board as possible. An antenna is made when there is some distance between two conductive lines. Using a ground plane makes this distance very small and therefore a poor antenna. Run wiring as close to a grounded part of the enclosure as possible. It is like having a ground plane. See above. Consider screened cable for sensitive signals. Again, it is like having a surrounding ground plane. As Stafford Aero Technologies is not a standard test house, we can provide you with a full CE marking solution - we won't just fail any non-compliant product and hand it back. We will work with you to fix it and ensure it complies. Contact us in confidence to discuss your requirements.